Nepali culture is very similar to the cultures of Tibet, and India, which borders to the north and south. There are similarities in clothing, language and food. A typical Nepali meal is dal-bhat – boiled dal served with rice and vegetables, and some spicy relish. This is consumed twice daily, once in the morning and again after sunset. Between these main meals, snacks such as chiura (beaten rice) and tea are consumed. Apart meat, eggs, and fish are considered a treat. In the mountainous region the staple diet are based on wheat, maize, millet and potatoes. Traditional Nepali folklore retains a strong influence in society and its stories are widely acted out in dance and music. Culture of different ethnic groups are rich in their own ways. The Newari culture is the original and distinguished culture of Kathmandu. Most of the festivals observed in the country are the Newari festivals. The Newar people are well known for masked dance that tell stories of the gods and heroes. The associated music is percussion-based, sometimes with flutes accompanying the intense, nasal vocal lines. Musical styles are a variety of pop, religious and folk music, among other styles. 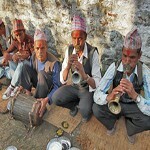 Musical genres from Tibet and India have had a strong influence on traditional Nepali music. Women, even of the musician castes, are less likely than men to play music, except in specific situations such as traditional all-female wedding parties. The Nepali year begins in mid-April and is divided into 12 months Saturday is the official weekly day of rest. Main holidays include the National Day (birthday of the late king Tribhuvan) December 28, PrithviJayanti, (January 11), and Martyr’s Day (February 18) and a mix of Hindu and Buddhist festivals such as Teej,Dashai in autumn, andTihar late autumn. The republican government of Nepal decided to announce the Christmas also as holyday just from 2009. Most marriages are arranged, and divorce is rare. Polygamy is banned by law; relatively isolated tribes in the north, such as the Dolpo, practice polyandry.